A total of 19 young service technicians have graduated from the latest John Deere Ag Tech, Parts Tech and Turf Tech advanced apprenticeship programmes, run by national training provider Babcock. Iain Bond from dealer Sharmans Agricultural Ltd of Melton Mowbray in Leicestershire was named ag & turf apprentice of the year, while parts apprentice of the year was Ryan Murch of Smallridge Bros Ltd, Barnstaple in Devon. 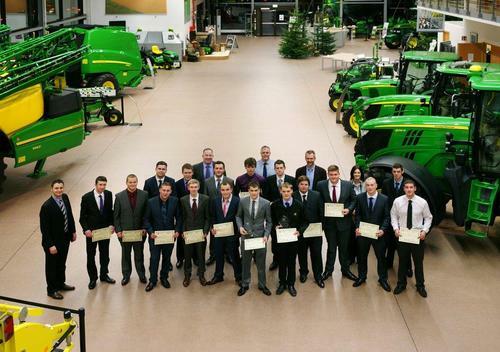 The group of third year students received their certificates at the John Deere Forum visitor centre in Mannheim, Germany during a specially arranged visit to the company’s tractor and cab factories and European Parts Distribution Centre (EPDC). The presentations were made by Deere & Company’s regional training delivery manager Dr Lutz Schueppenhauer, John Deere Limited training manager Chris Wiltshire and Babcock programme manager James Kesterton. These three-year apprenticeships lead to the BAGMA/City & Guilds of London Institute 4025 agricultural/groundcare service engineers NVQ Level 2 & 3 certificates and Level 3 IMI Diploma in vehicle parts competence. Apprentices can choose to complete their education for a fourth year to gain the John Deere Diploma and register at LTA2 level in the industry’s Landbased Technician Accreditation scheme, while starting their adult training within the John Deere University. Now in its 22nd year, Ag Tech was the first such scheme to be introduced in the UK and won a National Training Award at the end of 1997, the only one ever made to an agricultural machinery apprenticeship programme. Since the first programme started in 1992, more than 540 apprentices have graduated through all three John Deere schemes (Ag Tech, Parts Tech and Turf Tech) and are now working in the company’s nationwide dealer network. A new Customer Service Tech training programme was also introduced last autumn for the current training year.